I miss blogging at Brand Destruction Research but these days I'm spending my time at DanceLand. You can find dance videos and news with lots more to come. If you look what you see, please connect with us on Twitter and Facebook. Michael Arrington isn't really known for holding back, though maybe his move to Seattle is a sign he's softening (lol! ), so when he says "Media Attacks On Facebook And Mark Zuckerberg Are Getting Out Of Hand", it's got to be a sign of channel oversaturation. But that doesn't mean this tale is anywhere near an end. Most people do care about privacy on and off-line, no matter what their age, and Facebook will pay for its privacy games, one way or another. They're well on their way to embedding "untrustworthy" into their public image. So how could a goofy Beard and Moustache Championship be any better than a bunch of citizens breaking a Smiley Face world record? Glad you asked. 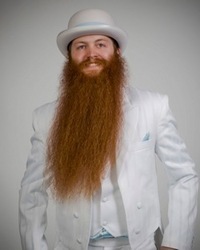 Though I'm personally not a big face of such contests, Bend, Oregon's campaign in support of the 2010 National Beard and Moustache Championships plays up a fun event unique to the area while also boosting local craft breweries and a "Balloons Over Bend" event. These unique offerings are not presented as a message to the nation regarding Bend's identity but as aspects of that identity. To me, the Bend events represent happy places, inasmuch as I can say "happy places" and keep a straight face, while Baltimore's campaign is bearing the joint brunt of death by committee and overloading the mule. It's just too much and not enough all at the same time. 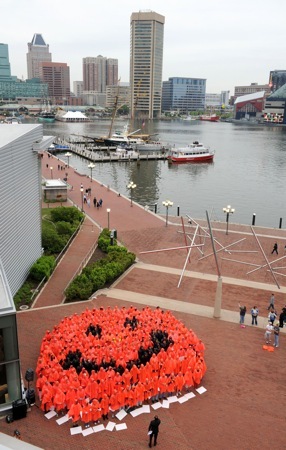 Baltimore's Record Breaking Smiley Face - 250 People Strong! Ok, so they hire an ad agency from New York where people aren't as friendly as Baltimore and, thinking that Baltimore is somehow uniquely friendly rather than simply "not being New York", they think that's a selling point, or something. Under guidelines provided by Guinness World Records(TM), Visit Baltimore smiled its way to setting the new record for the world's largest human smiley face last night. The giant grin took form with the help of 250 city residents and tourism professionals donning brightly-colored orange and black ponchos. This event kicked off the city's new "Find Your Happy Place in Baltimore" campaign and was staged outside the Maryland Science Center, overlooking Baltimore's famous Inner Harbor. Find Your Happy Place in Baltimore is a citywide partnership that begins on Memorial Day Weekend. A special microsite, www.BmoreHappy.com, will launch on May 21st 2010, and will direct visitors to happy stays hotel packages, give them the ability to build custom itineraries based on what makes them happy, and provide details on how to enter a "Sweet-stakes" to win great prizes including a cruise from Baltimore on Royal Caribbean, a trip to Sarasota, Florida for Orioles spring training and a variety of other prizes. Visitors can even pick up a "Happy Detector" at the Baltimore Visitor Center to uncover hidden codes around the city that will allow them to enter the Sweet-stakes multiple times. The campaign will run through December 2010, coinciding with an exhibition at the American Visionary Art Museum, "What Makes Us Smile," opening in October. I get it now. You win things! So what's with the record breaking smiley face that could be easily broken tomorrow (250 people, that's it's for a world record?)? I guess the prizes, like the "trip to Sarasota, Florida for Orioles spring training', make you think about things you'd enjoy doing in Baltimore or in other cities where Baltimore citizens travel. Sorry, but I'm getting lost again. The Find Your Happy Place in Baltimore concept is derived from extensive research that shows people are looking to do things that make them happy after the economic downturn. According to the study by Context-Based Research, people are going back to basics and embracing life's simpler things that make them smile and laugh - spending quality time with loved ones, traveling, among others. Visit Baltimore is capitalizing on this national trend with a comprehensive program that promotes those places and things in Baltimore that are certain to make visitors happy. Wow, that's great! So why am I not the least bit interested in Baltimore at this moment? Like it or not, this was your first look, Baltimore, and it's not going so well. I like the idea of the Museum show and, sure, Sweet-stakes is a fun title for a giveaway, but you just introduced yourself with a smiley face campaign for a world's record, i.e., a gimmick. And now a bunch of blogger/losers are going to make fun of you cause anybody can do a smiley face. But what can Baltimore do that's special and about that place? That's where the payoff will be, from promoting real things about a real place that really make people happy. Not from trivializing people's deep desires by equating such desires to a stupid smiley face. We're not tracking individuals on Brand Destruction Research though we do look at stats in the aggregate.